Mayo 1-12 NUIG 1-10 (MacHale Park, 3/1/2016). MAYO: Robbie Hennelly (0-1, a free); Brendan Harrison, Kevin Keane, Padraig O’Hora; Colm Boyle (0-1), Shane McHale, Shane Nally; Jason Gibbons, Tom Parsons; Kevin McLoughlin (1-4, four frees), Mark Ronaldson (0-1), Darren McHale (0-1); Keith Ruttledge, Jason Doherty (0-1), Conor Loftus (0-3, two frees). Subs: Mikey Sweeney for Ruttledge (41), Keith Higgins for S McHale (51), Caolan Crowe for Gibbons (54), Ger Cafferkey for O’Hora (57). Mayo 1-16 IT Sligo 0-8 (James Stephens Park, Ballina, 10/1/2016). MAYO: Matthew Flanagan; David Kenny, Ger Cafferkey, Brendan Harrison; Keith Higgins, Shane McHale, Shane Nally; Jason Gibbons, Caolan Crowe; Kevin McLoughlin (1-2), Mark Ronaldson (0-4), Andrew Farrell (0-1); Darren McHale (0-1), Jason Doherty (0-3, two frees), Keith Ruttledge (0-3). Subs: Lee Keegan for Higgins, Colm Boyle for Nally (black card), Donal Vaughan for McHale, Tom Parsons (0-1) for Farrell, Conor Loftus (0-1) for Ruttledge, Padraig O’Hora for Harrison. Mayo 0-10 Roscommon 0-13 (MacHale Park, 17/1/2016). MAYO: Robbie Hennelly; Ger Cafferkey, Kevin Keane, Padraig O’Hora; Keith Higgins, Caolan Crowe, Colm Boyle; Tom Parsons, Jason Gibbons (0-1); Donal Vaughan, Mark Ronaldson (0-1), Darren McHale; Keith Ruttledge (0-1), Jason Doherty (0-2, frees), Conor Loftus (0-5, four frees). Subs: Lee Keegan for Higgins, Shane McHale for Keane, Diarmuid O’Connor for Ruttledge, Shane Nally for Boyle, Brendan Harrison for O’Hora, Brian Reape for Loftus. ROUND 1: Fermanagh 0-8 Mayo 1-11 (Belleek, 2/1/2016). MAYO: Matthew Flanagan (0-2); Eddie Doran, Seamus Cunniffe, Ciaran Harrison; James Kelly, Shairoze Akram (1-0), Jason Forkan (0-1); Matthew Ruane, Val Roughneen; Fergal Boland, Michael Plunkett, Barry Duffy (0-1); Cathal Barrett, Brian Reape (0-3), Fionan Duffy (0-4, one free). Subs: James Lyons (for Barrett 40), James Carr (for Reape 49), Conor Kilkenny (for Doran 50 – inj. ), Ronan Carolan (for F Duffy 52), Colm Reape (for Roughneen 52), Ryan Lynch (for Plunkett 52). ROUND 2: Mayo 3-12 Sligo 0-4 (St Tiernan’s Park, Crossmolina, 9/1/2016): MAYO: Matthew Flanagan (0-1, ’45); Eddie Doran, Seamus Cunniffe, Ciaran Harrison; Jason Forkan, James Kelly, Shairoze Akram (0-2); Ryan Lynch, Val Roughneen; Fergal Boland (0-1), Michael Plunkett (0-1), Matthew Ruane; Ronan Carolan, Brian Reape (2-1), Fionan Duffy (1-4, penalty goal and a free). Subs: Scott Kilker for Flanagan, Liam Irwin (0-1, free) for Fionan Duffy, Barry Duffy for Forkan, James Lyons for Ruane, Colm Reape (0-1, free) for Brian Reape, Morgan Lyons for Plunkett, Michael Murray for Roughneen, Cathal Barrett for Carolan. ROUND 3: Donegal 1-9 Mayo 1-8 (O’Donnell Park, Letterkenny, 16/1/2016). MAYO: Scott Kilker; Eoin O’Donoghue, David Kenny, Ciaran Harrison; Barry Duffy, Michael Hall, Michael Plunkett; Mikey Murray, Val Roughneen; Fergal Boland (0-3), Brian Reape, James Lyons; Morgan Lyons (0-1), Colm Reape (0-2), James Carr. Subs: Ronan Carolan (0-1, free) for Carr, James Kelly for Hall, Jason Forkan for Kenny, Liam Irwin (1-1, point a free) for Colm Reape, Cathal Barrett for M Lyons, Ryan Lynch for Murray, TJ Byrne for James Lyons, Morgan Lyons for Boland (black card). FINAL: Mayo 1-9 Donegal 1-9 (after extra-time) (Sligo Centre of Excellence, Scardan, 23/1/2016). 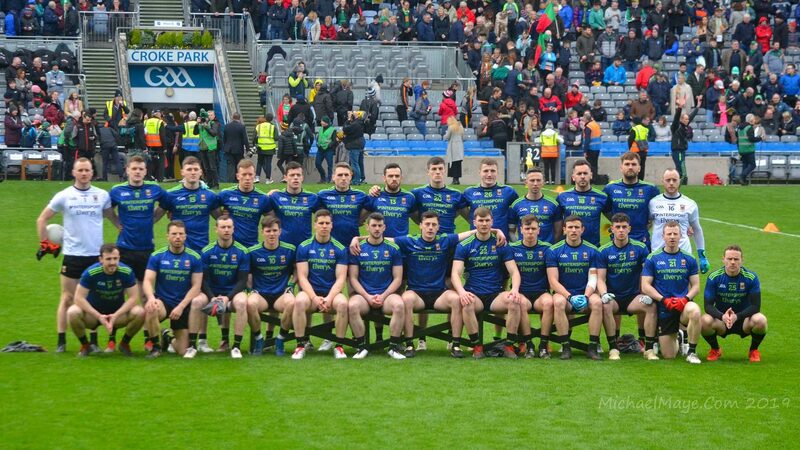 MAYO: Matthew Flanagan; David Kenny, Seamus Cunniffe, Ciaran Harrison; Barry Duffy (1-1), James Kelly, Shairoze Akram; Val Roughneen, Padraig Prendergast; Fergal Boland, Michael Plunkett, Matthew Ruane; James Lyons, Brian Reape (0-2, one free), Liam Irwin (0-5, three frees). Subs: Mikey Murray (0-1) for Prendergast, Cathal Barrett for Roughneen, Eoin O’Donoghue for Kenny, TJ Byrne for Kelly, Ryan Lynch for Ruane. SEMI-FINAL: Leitrim 0-15 Mayo 4-12 (Páirc Seán MacDiarmada, Carrick-on-Shannon, 19/3/2016). MAYO: Matthew Flanagan; Eddie Doran, Seamus Cunniffe, Ciaran Harrison; David Kenny, Michael Hall, James Kelly; Val Roughneen, Stephen Coen; Fergal Boland (0-2), Conor Loftus (0-4, one free), Diarmuid O’Connor (1-0, penalty); Michael Plunkett, Brian Reape (2-3), Fionan Duffy (1-2). Subs: Matthew Ruane (0-1) for Roughneen, Eoin O’Donoghue for Cunniffe (blood), Shairoze Akram for Kelly; TJ Byrne for O’Connor, James Lyons for Loftus, Mikey Murray for Coen. FINAL: Roscommon 1-10 Mayo 1-11 (Markievicz Park, 2/4/2016). MAYO: Mattie Flanagan; Eddie Doran, Seamus Cunniffe, David Kenny; Michael Hall, Stephen Coen, Shairoze Akram; Matthew Ruane, Diarmuid O’Connor; Fergal Boland (0-1), Conor Loftus (0-3, frees), Michael Plunkett (0-1); Liam Irwin (1-3, two frees and a ’45), Brian Reape (0-1), Fionan Duffy (0-2). Subs: Eoin O’Donoghue for Doran, James Carr for Loftus. SEMI-FINAL: Mayo 1-15 Dublin 1-14 (O’Connor Park, Tullamore, 16/4/2016). MAYO: Matthew Flanagan; Eoin O’Donoghue, Seamus Cunniffe, David Kenny; Michael Plunkett, Michael Hall, Shairoze Akram (0-1); Matthew Ruane (0-1), Stephen Coen (0-1); Fergal Boland (0-2), Conor Loftus (0-4, frees), Diarmuid O’Connor (1-1); Liam Irwin (0-4, three frees), Fionan Duffy (0-1), Brian Reape. Subs: Eddie Doran for Cunniffe, James Carr for Duffy, James Kelly for Plunkett. FINAL: Mayo 5-7 Cork 1-14 (Cusack Park, Ennis, 30/4/2016). MAYO: Matthew Flanagan; Eoin O’Donoghue, Seamus Cunniffe, David Kenny; Shairoze Akram, James Kelly, Michael Hall; Matthew Ruane (0-1), Stephen Coen; Fergal Boland, Conor Loftus (2-2, two frees), Diarmuid O’Connor (1-0); Liam Irwin (2-2, one free and one ’45), Fionan Duffy, Michael Plunkett (0-2). Subs: James Carr for F Duffy, Barry Duffy for Kelly, Morgan Lyons for Plunkett. SEMI-FINAL: Leitrim 1-8 Mayo 4-11 (Páirc Seán Mac Diarmada, Carrick-on-Shannon, 29/6/2016). MAYO:Adam Byrne; Cathal Horan, Donovan Cosgrove, John Cunnane; Brian O’Malley, Matthew Macken, John Maughan; Colm Murphy, Nathan Moran; Paul Lambert (0-2, one free), Ross Egan, Oisin McLaughlin (0-3, one free); Colm Moran (0-1), Ryan O’Donoghue (3-4, one free), Nathan McGee (1-0). Subs: Conor Stenson (0-1) for Nathan Moran, Sean Kenny for O’Malley, Tommy Conroy for McGee, Stephen McGreal for Egan, Liam Kelly for Macken, Ethan Gibbons for Colm Moran. FINAL: Galway 1-9 Mayo 0-6 (Pearse Stadium, 10/7/2016). MAYO: Adam Byrne; Cathal Horan, Donovan Cosgrove, John Cunnane; Brian O’Malley, Matthew Macken, John Maughan; Colm Murphy, Nathan Moran; Paul Lambert (0-1), Ross Egan, Oisin McLaughlin (0-1); Colm Moran (0-1), Ryan O’Donoghue (0-2, frees), Nathan McGee. Subs: Conor Stenson for Murphy, Stephen McGreal for McGee, Ethan Gibbons (0-1) for Egan, Justin Healy for McLaughlin, Liam Kelly for Horan. QUARTER-FINAL: Kildare 2-14 Mayo 2-8 (O’Connor Park, Tullamore, 1/8/2016). MAYO: Adam Byrne; Seán Kenny, Donovan Cosgrove (0-1), John Cunnane; Brian O’Malley, Matthew Macken, John Maughan; Colm Murphy, Nathan Moran; Paul Lambert (1-0), Conor Stenson, Oisin McLaughlin; Colm Moran (0-4, one free), Justin Healy (0-1), Ryan O’Donoghue (1-0). Subs: Joe Mason for Maughan (black card ), Stephen McGreal (0-1) for Mason (black card), Liam Kelly for Cunnane (black card ), Conor Diskin (0-1, ’45) for Murphy, Ross Egan for McLaughlin, Nathan McGhee for Healy.